Last weekend we went to The Amaizing Corn Maze as our weekend family outing. The sun was shining, the weather was beautiful... it was the perfect day to go strolling through a big field of corn! We began our corn maze adventure, hoping to find all 18 check points scattered throughout the 3 mazes. Just to ease into things we started with the smallest maze first. After a couple circles and "We've been here before" moments, we were back on track to finish the maze. From start to finish, all 3 mazes... it took us almost 1 1/2 hours. We had a fantastic time, worked together as a team and got some great exercise! I credit our success to my husband, without him the kids and I would probably still be trying to find our way out of the last corn maze! The Amaizing Corn Maze has been providing wholesome family fun since 2004. Which just happens to be the same year my youngest child was born. At The Amaizing Corn Maze there are 3 different mazes throughout 12 acres of corn, including the maze of terror! They have also added several new features and attractions to the corn maze this year. By participating in the maze game and corn cannon you will be eligible to win some great prizes! Each week through the closing of the Amaizing Corn Maze, there will be a different non-profit organization providing discount admission coupons. Those coupons will be good for every member in your party. So, if the coupon is for $1 off and there are 10 people in your party, you will receive $10 off admission! Some of those wonderful organization are: Valley Youth Soccer, Sorenson Elementary, Girl Scouts and Campfire Girls. Be sure to follow The Amaizing Corn Maze on Facebook to keep up on the latest news, events and giveaways. 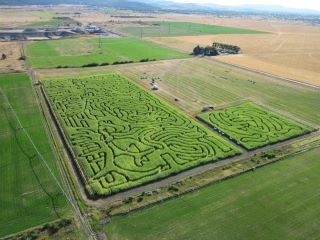 The Amaizing Corn Maze opened on September 23rd and will remain open through October 30th! Open Friday, Saturday and Sunday’s September 23rd – October 30th. Take a right onto Beck Road (at the Stateline Speedway Sign) travel 1.9 miles and the maze is on the right side of the road. Travel .4 miles on Beck Road and the maze is on your left. Love the pictures! We are a bit behind on our fall activities this year. We just got to the pumpkin patch a couple of days ago, and the kids were running late so by the time we arrived it was already their naptime. Between the picking of the pumpkins and the playing in the buckets of dried corn, we ran out of time to do the corn maze! Ah, well, there's always next year! We just did our first corn maze to! We loved it. SO much fun! Glad you all had a good time!